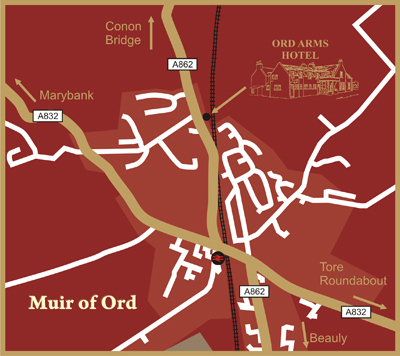 Head North on the A9 and at the Tore Roundabout take the first exit onto the A832 to Muir of Ord. Once at the village, carry on straight, past the ‘Co-Op’ shop, over the railway bridge and continue until you reach the hotel which will be on the right. Take Maryburgh exit heading towards Conon Bridge on the A862 continuing to Muir of Ord. Once entering the 30mph zone the hotel will be on the left. You can either call Reservations on 01463 870286 or send an email to with details. Please include name of each person staying, a contact number, the dates prefered and any special requirements.